Stamford, Connecticut, dreamed for nearly 100 years of a having a grand park in the heart of its downtown and a greenway along the banks of the historic Mill River. Once a polluted, neglected riverfront, Mill River Park is now a vibrant civic space that is accessible to neighborhoods and provides a needed green space in the economic hub of Stamford. Movie night at Mill River Park Playground. Photo courtesy Olivier Kpognon. The history of the park begins in 1997, when Mayor Dannel Malloy found a copy of Stamford’s first master plan, which called for a park along the banks of the Mill River. He commissioned Sasaki Associates to conduct a study on the park area. The result was the Mill River Corridor Plan to reclaim and create an open green space in the heart of Stamford as a gathering place. The plan recommended creating 19 acres of new open space and restoring an existing seven acres. Over the next several years, the plan was included in the Stamford Master Plan, a new zoning district was created, a project plan was adopted by the Urban Redevelopment Commission, and the city established accounts for property acquisition and park development. Damming and debris had obstructed the river, and incoming tides left the downtown exposed to significant flood risk. In 2000, the Army Corps of Engineers studied the restoration of local ecosystems and encouraged removal of the historic Mill River Dam to allow the river to flow freely for the first time in nearly 400 years. In collaboration with the Corps, Olin Partnership was selected in 2005 to design the park. The final design restored the stream channel to reintroduce migrating fish, reestablished wetland habitat, and improved public access to the river. Thousands of new bulbs, grasses, perennials, and native shrubs and trees give the park a beautiful palette of colors and textures throughout the year and have encouraged the return of native birds, reptiles, and small mammals. Park staff and volunteers, including student groups, are continuously trained to identify and remove invasive species and to lead an ongoing effort to teach the surrounding community the value of environmental stewardship. The vision for the park included a place for children throughout Stamford to exercise and play together, and so the Mill River Playground was born. In a true community effort, 1,500 volunteers from dozens of companies and organizations built the playground during a seven-day community build. Led by a local art teacher, a group of students, teachers, and parents created five wildlife murals on six-inch tiles that are on display at the playground. Programming at Mill River Park has been key to its success and draws diverse groups from across the city. Family enjoying the river. Photo courtesy OLIN/Sahar Coston-Hardy. Stamford has thrived through its proximity to New York City, diverse demographics, and excellent schools, making it a center for growth. Mill River used to separate Stamford’s downtown from the West Side, Stamford’s lowest income census tract, but now operates as a meeting place for these once divided neighborhoods. 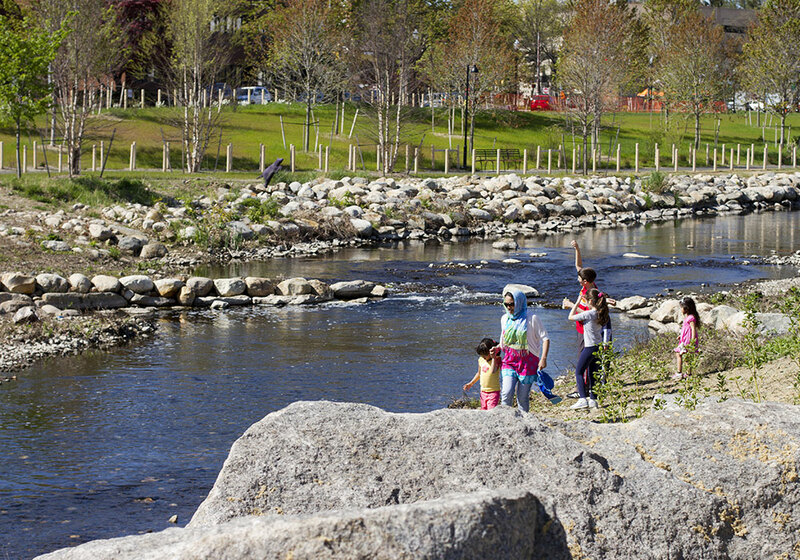 Mill River Park has transformed access to nature and play space for all ages, providing a new model for redefining urban life and attracting new residents. Most events held in the park are free and open to the public. Playground for children encourages healthy and active forms of recreation. Mill River Park is ADA accessible. It's one-half mile from the Stamford Train Station with commuter and Amtrak service, and one block from eight different bus lines. The park reinforces Stamford as a place to settle for people in all stages of life. Free family events include Movies in the Park, Carousel Storytime, Fun Saturday Mornings, and the new Nature Tots Mommy & Me program. The staff leads educational walks to help the public better understand native plants and animals. Staff also provides a year-round program for all fourth graders at six elementary schools. Each summer, the Collaborative hosts 15 high school students and two college interns for a 10-week paid environmental stewardship internship program. Park amenities include the Brownstein|Selkowitz Carousel Pavilion and the Steven & Alexandra Cohen Skating Center and Fountain. 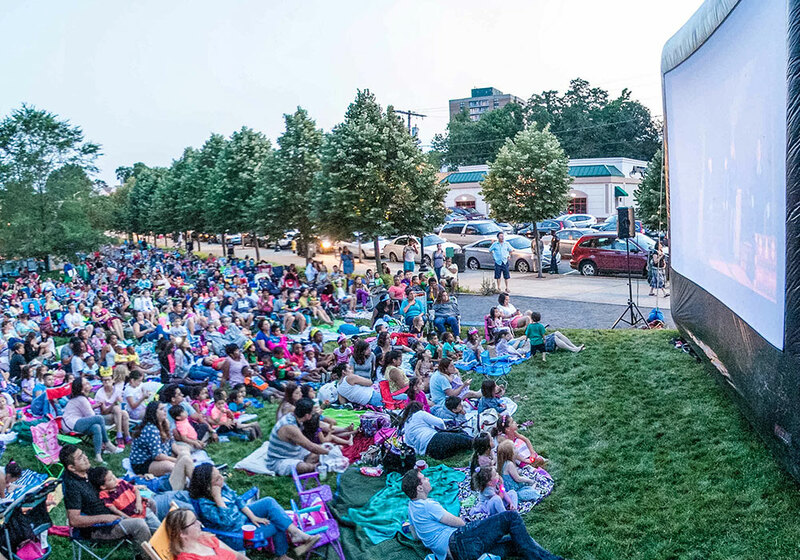 Weekly fitness classes from spring to fall, summer movie nights, and large festivals bring residents from neighboring towns. 400 trees and thousands of shrubs were planted during phase one of the park’s construction. Over 1,000 new housing units are located just two blocks away from the park. $4 million in new annual municipal tax revenue has been generated since the park opened. Completed aspects of Mill River Park are bordered by West Broad Street, Washington Boulevard, Tresser Boulevard, Main Street and Mill River Street, covering 15.5 acres. 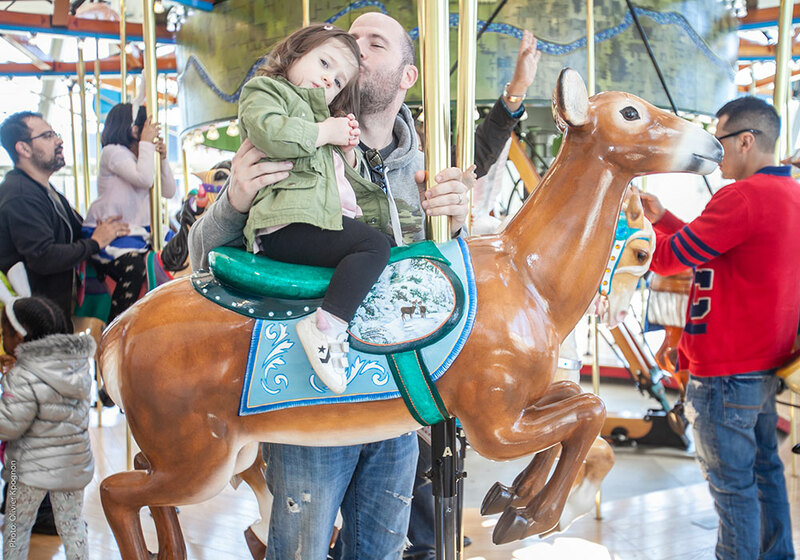 Father and daughter on Nissen Carousel at Mill River Park. Photo courtesy Olivier Kpognon.